The NFC West matchup between the emerging Seahawks and reigning division-champion 49ers will be a physical affair, pitting two strong defenses and powerful running attacks. “It’s going to be a brawl, and we know that,” Seahawks linebacker Leroy Hill told the Seattle Times this week. “That’s how I remember San Fran as long as I’ve been in the league. Over my eight years, I’ve played them 14, 15 times. It’s a brawl when you play San Fran, and that was before (Jim) Harbaugh even got there. Both teams come into the Thursday night game at Candlestick Park at 4-2 and on just three days of preparation following games on Sunday. The Seahawks are coming off a 24-23 victory over the visiting Patriots, while the 49ers are trying to rebound from a 26-3 loss to the New York Giants, the most lopsided loss by the Niners since Harbaugh became head coach last season. Despite that defeat, NFL oddsmakers are predicting a 49ers rebound, making them a seven-point favorite. San Francisco swept the season series with Seattle last season, but the Seahawks are a different team in 2012. Rookie quarterback Russell Wilson has added a spark, and has shown he can run, throw and make big plays late in a game. Against the Patriots Sunday, Wilson completed 16 of 27 throws for 293 yards and three touchdowns with no interceptions, and his 46-yard pass to Sydney Rice with 1:18 left proved to be the game-winner. The Seahawks like to run the ball with rugged running back Marshawn Lynch, the former Cal star who is third in the NFL with 549 yards rushing and a 4.3-yards per carry average. Though he was held to just 41 yards against the Patriots, Lynch has had two 100-yard games this season and is coming off his best season in 2011, when he rushed for 1,204 yards and 12 TDs. In addition, Seattle’s defense – like San Francisco’s – is solid. Seattle has allowed just 15.5 points per game, which ranks No. 2 in the NFL; San Francisco is No. 3, at 15.7 points per game. Seattle is No. 2 in the league, allowing just 4.7 yards per play; San Francisco is No. 1, allowing 4.6 yards per play. San Francisco is No. 1 in the league in overall defense, allowing 275.8 yards per game; Seattle is No. 4, at 294.7. Though the 49ers were 13-3 last season, won the NFC West title and advanced as far as the NFC Championship Game, the Seahawks see themselves as an up-and-comer, and this game as a chance to show the country on national TV that they are a serious contender. For the 49ers, this game begins a set of three straight games against NFC West foes Seattle, Arizona and St. Louis – and a chance to get rid of the taste left from Sunday’s crushing loss to the Giants. 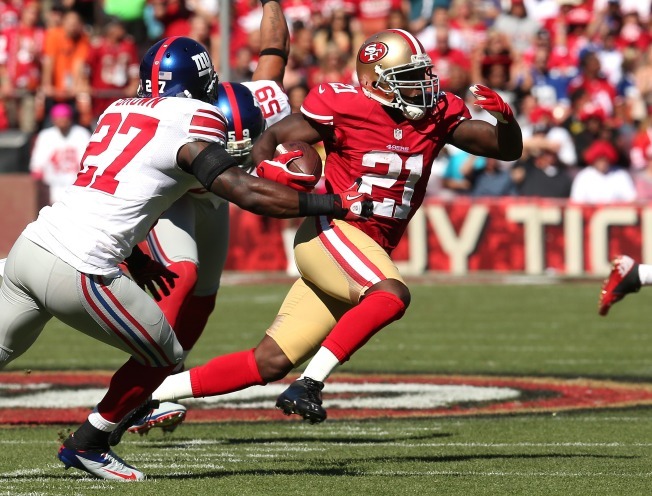 Against the Giants, the 49ers turned the ball over, couldn’t stop New York’s running game and got away from their own running emphasis, giving the ball just eight times to Frank Gore, who had just 36 yards rushing. Alex Smith, who went into the Giants game as the NFL's leading passer, threw three interceptions. This is a chance for Harbaugh to get his team back on track. He says this will be an “ultimate challenge” for his team.